Ansonia Clock Company, crystal regulator, "Crown", C. 1914. 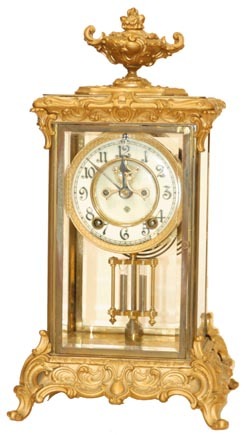 The 15.5" high case came from the factory with a polished brass body and gold gilt ornaments, which included the urn top, the base including feet, and the wrap around ornament just above the dial. The brass body has never been polished. It would certainly improve the looks of the case to polish lightly. The ornaments were restored in a Syrian Bronze shade which looks very nice in place of the bright gold. One of the 4 glasses has a corner crack; imitation mercury 2 jar pendulum has one chipped vial; 2 small corner attachments in the back are missing; the 2 piece porcelain dial has 2 repaired chips and some small hairlines. The urn and urn base is the style normally seen on the Crown model. The urn base was broken and repaired. 8 day, half hour cathedral gong strike, running just fine. This clock is not nearly as bad as I have made it sound. It looks very good and runs great, it is when you take your eye glass and inspect closely that you see the faults. Ly-Ansonia #357.